​We can answer that by looking at holding styles. 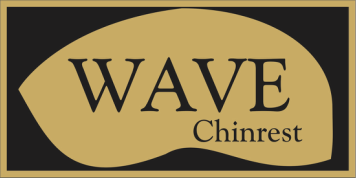 WAVE I has a higher, more-pronounced lip, and more of a drop-off from the right to left on the chinrest rest plate. WAVE II is flatter, with less of a lip, and a more gradual drop-off from right to left. ​Let's look at how you hold your instrument. ​Some players like their instrument in front of them, or holding their head more looking straight forward. They often like for a lip on the chinrest, to "hook" their jaw over. Others prefer spinning their heads over to the left, more in line with the shoulders. The forward-looking players find that the WAVE I often helps with stability, giving a secure perch for their jaw. The left-looking ones often find that the WAVE II provides a trouble-free platform; for them, however, WAVE I often tends to "rotate" around them to the front, under their jaw. Generally, a player who holds the their head or their instrument more to the front will prefer the WAVE I, with its higher lip. ​With the purchase of one, we'll send you up to three additional models to try for 30 days. Try them all out- practice with them, use them in concerts, get to know them. Choose the one you feel most comfortable with, and send the others back. ​Yes, if the WAVE isn't for you, we'll refund 100% of the purchase price, plus any original postage. Simply return them- pay only for return postage. ​Watch the videos on choosing the correct WAVE here. ​Want to go more Extreme? ​See our ultra-low WAVE Da Capo, possibly the lowest chinrest available. Get the idea here, pictures here, and video here.